The State Training and Employment Program is administered by the Alaska Department of Labor and Workforce Development, Division of Employment and Training Services and funded by a set-aside from the Unemployment Insurance Trust Fund. The purpose of STEP is to enhance the quality and make Alaska job training and employment assistance easily available to employers, employees, and future workers. STEP fosters economic growth by preparing Alaskans with competitive, employable skills. The program benefits existing companies and attracts new businesses to Alaska by preparing a local workforce skilled in traditional, new, or emerging fields. Who should apply for a STEP grant? Non-profit or for-profit organizations, educators, industry trainers, employers and other organizations should apply for a STEP grant to enhance employee skills to meet industries demand for skilled workers. The Division of Employment and Training Services administers the STEP grants. When available, the Request of Grant Applications can be found on the state’s on-line public notice web site. The Division has implemented a new electronic on-line grant management system, EGrAMS, for performing grant management activities on-line. STEP targets adult worker who may be employed or employable, have worked in a job covered by unemployment insurance and who need training to improve their prospects for obtaining or retaining employment. Ideal participants are seeking skills to improve their current employment situation. The goal of STEP is to help self-motivate individuals with realistic goals gain essential skills for employment success. The benefit STEP participants realize as they move forward in their careers aided by STEP training is increased earning potential. Employers who invest in a skilled workforce gain a competitive edge in business and benefit from costs incurred in supporting unemployment insurance for those not working. Individuals with a work history seeking ways to improve their employment prospects are encouraged to contact one of the many job centers in Alaska and schedule a time to meet with a career counselor. The purpose of the meeting is to match your skills and abilities with training that best fits your needs. Visit a state job center near you to learn more and get started. The Alaska Job Centers Network provides contact information on all locations. The Division of Employment and Training Services provides a useful list of resources on their web site if you are looking for more online information. Jennifer Sullivan is a second year apprentice in the Alaska Piledrivers and Divers Apprenticeship Program. After graduating from high school in North Pole, Alaska, she attended the University of Alaska Fairbanks where she felt college was not the right path and found herself working odd jobs for a few years. During this time, Jennifer realized she didn’t want your stereotypical job and decided to attend a 53 week commercial dive program. During her time at the dive school she was instructed in all aspects of diving and underwater welding. After earning her commercial dive certificate and various welding certificates, she went to work for a company in San Francisco performing weld inspections, concrete sampling, and torque testing. 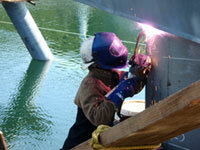 In the spring of 2008, Jennifer joined the Alaska Piledrivers and Divers Apprenticeship Program. Since joining the apprenticeship program, Jennifer has increased her skills and earning potential by gaining additional certifications in rigging, aerial lift, forklift, first aid/CPR, hazmat, OSHA 10, NSTC, oxygen first aid for diving injuries, stick feed, and wire feed pipe welding. Jennifer began working for American Marine in the diving division in May 2008 before going on to work on the Gakona River Bridge for Granite Construction in September 2009. When she is diving she earns $77.00 per hour plus benefits and when working as an apprentice piledriver and welder she makes $26.64 per hour plus benefits. With the assistance from the State Training and Employment Program while in training, Jennifer has found her dream job. Every day is an adventure and a chance to learn something new. Where can individuals access STEP services? Do I need to be a resident of Alaska to qualify for a grant? Yes. Alaska residency is a program requirement. Who is eligible to receive STEP funding? Individuals are eligible if they have worked in a position covered by unemployment insurance within the last 5 years and need skills to increase their employment outlook. Employers or organizations who are seeking training to increase workers skills to meet industry demands for individuals who have contributed to Unemployment Insurance within the last 5 years. What are high demand industries? Health care, construction, information technology, education, natural resource development, transportation, hospitality and tourism, and seafood harvesting and processing.